Whenever I was sick as a young child, my mother would thrust the small Chinese-designed bowl of watered-down rice at me…. “Eat this….it will make you better.” she would say lovingly in Mandarin. And I grew to love it. “Xi Fan” (pronounced like “Shee Faun”) is what my family from Taiwan calls rice porridge – a Chinese staple. “Zhou” (pronounced like “Zo” but with a bit of a “j” sound with the “z”) and “Congee” would be the words I would later learn for it when I moved to NYC in my adult years. I am too accustomed to “Xi Fan” so I still call it that til this day. It’s a wonderfood. A comfort food. A simple food….or it can be a well-dressed food; the latter for this particular recipe. 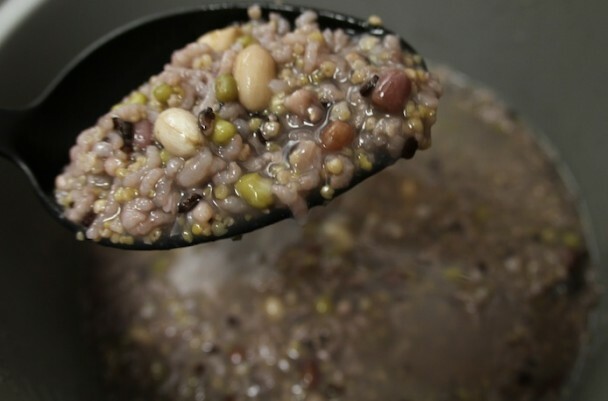 This is not plain, white, rice porridge and befitting of its name, “8 Treasure Porridge” is a complicated gumbo of amazing grains and assorted tastes – usually a tad sweet, unlike plain congee. The ingredients in this recipe differ from other “8 Treasure” recipes but it’s okay if yours is not the same. China is such a vast country that each area has their way of making it – although I noticed that in Sichuan’s west, I could not find it for breakfast – dumplings reigned there. It’s your choice to follow the recipe or to let your creativity lead you and make your own version – maybe add a bit of coconut milk, or other dried fruits – apricots? I hadn’t heard about ‘8 Tresure Congee’ until recently. I discovered this Chinese traditional food from a fellow climber/rider, Szu-Ting when we were visiting XiShuangBanna (city in the south of China, heavily influenced by the Thai culture). It was late, and after walking around all day, we needed nourishment and came across a restaurant that served it, accompanied with a flat, corn-meal pancake. Super tasty….. Here is the recipe to let you know of its existence and hopefully you’ll try it! Not just for taste but for your good health. In some stores, you can buy the combination already made (especially at an Asian market or health food store). 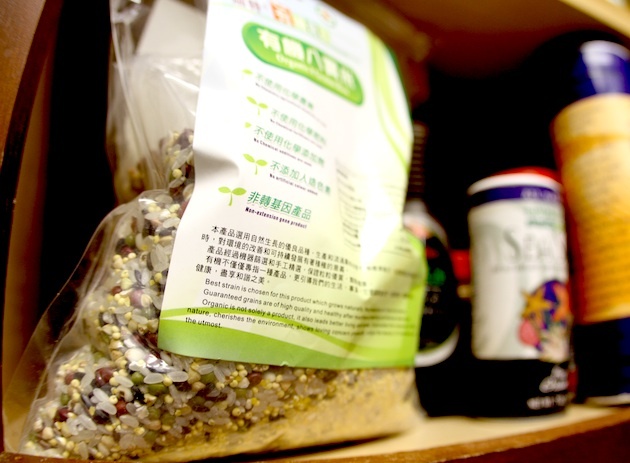 But you can easily buy all the ingredients (8 types of grains or dried fruits) and combine it all. From there, it’s ridiculously easy. Just add twice as much water for each cup – boil and check it to see if it’s at the consistency you like. You can add more water for a thinner “soup” or leave it as porridge. Eat it hot in the fall and winter – cold in the summer! Rinse, drain and dry all ingredients in (1). Place all ingredients in a large claypot or rice cooker, add in water and boil on medium for 3 hours, covered. Rinse dried longan fruit flesh and red dates, stir both into the porridge together with the rock sugar. Cook for another 2 hours. « Riding Across China: Yunnan’s Second Leg Disasters and Delights. We wish to purchase the package pictured above. Can you identify by English name or company who makes it. Thanks much.